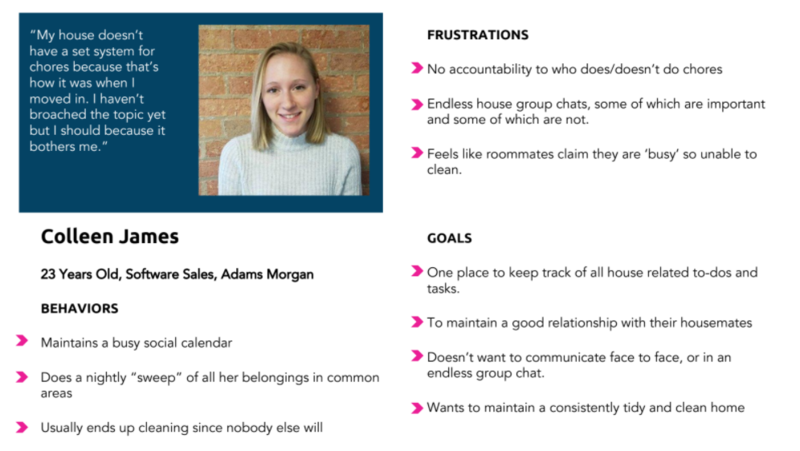 Froomie is a house chore feed and distribution app that helps streamline roommate communication. MY ROLE: I undertook this project entirely on my own, though benefited enormously from the insightful advice and guidance from my classmates and teachers. Washington DC has notoriously expensive housing. Since living alone is out of reach for many young professionals in the city, many live with roommates in group row houses with as many as 2 to 6 roommates. This trend presents an interesting problem. There’s no mom or dad around. There's no RA at the end of the hall. At the same time, it’s more important than ever that these shared spaces remain functional. Nobody wants roommate stress to greet them after a 10-hour work day. While living in group housing is a convenient, social, and economically feasible alternative for many young adults today, this setting presents specific challenges to managing peer relationships. Discover pain points of living with roommates. See if shared responsibilities were an issue in most households. In what ways do people already solve tasks like chores, bill payments, etc.? Are these effective? Explore how users currently communicate with roommates, and how effective those methods were. How frequently do they talk? Is this a positive or negative experience? 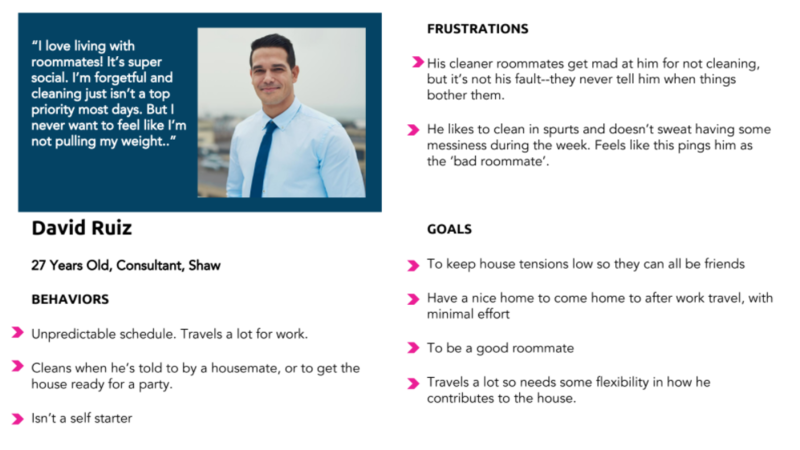 I conducted in-person interviews with six DC residents who were currently living with roommates. Everyone was willing to do chores as long as it was fair & flexible. People truly enjoy living with roommates for the social aspect. While many were living in shared houses for the financial aspect, many respondents said they viewed having roommates as a positive aspect of their living situation. While each house's issues were unique, the underlying causes seemed the same: poor communication. I did a competitive analysis of 3 apps that dealt with shared responsibilities or tasks: ChoreMonster (chores), Homey (chores), and Venmo (group finances). From my research I created 2 personas. I knew that the app would be useless if everyone in the house did not use it, so whatever I created would need to work for various personalities. I started with low fidelity paper wireframes to get the general app layout solidified. I wanted the app to largely mirror Venmo, since it was a pattern users would likely be familiar with. After developing a prototype I set out to user test. I developed a set of questions that would run users through the important features of the app and see what was working and what needed help. You have a chore that's been reassigned to you by your roommate David. You're free this week so you agree to take it over for him. You come home and clean the sink, a task you were supposed to do last week. On your way in, to your annoyance, you notice the recyclables are overflowing. How do you address these two things? After a stressful week at work you've come home to a sparkling clean home. Show your appreciation to your housemates. As a house, you agree that you're going to start composting. Add this to your household list of chores to rotate through. The bins need to be emptied 3x per week. Icons were not clear enough. People weren't entirely willing to give up their passive aggressive communications. Needs to be a way to gently 'nudge' someone into doing their chores. The app works well but it's not so much "fun". Need a hook to keep users coming back instead of ignoring push notifications. NEW ICONS: Icons were standardized and one's active page was now noted with a colored icon. SOCIAL ASPECT: The first iteration was more designed with the persona #1, Colleen, in mind. This is the user who is already doing their chores and simply sees this app as a convenient way to keep track or remind them. But what keeps persona #2, David, coming back? 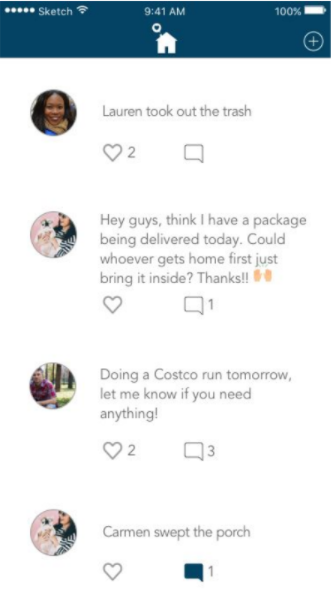 In the initial user interviews many users stated how fun and social living in a group house setting can be and I wanted to incorporate that back into the app. The newsfeed could now be group discussions and announcements, along with chores. REMIND BUTTON: Similar to Venmo's button, a way to nudge someone into doing a chore they (intentionally or not) forgot to do that week. 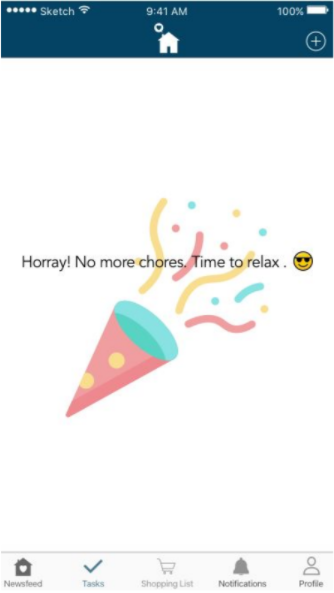 PUNCHIER COPY: Chores and group responsibilities aren't that much fun at the end of the day. It's nice to be thanked or rewarded, even if it's just by an app. PUSH NOTIFICATIONS: Weekly reminders can help users stay on task. Household tips and tricks can be an additional use of push notifications, since many young adults struggle with cleaning or basic household tasks those first few years out of college. Simple tips like how often you should defrost your refrigerator, or a timely reminder to clean out your gutters come winter, can be pushed out to the group. CLEAR NOTIFICATIONS: Cleaned up how notifications work to better streamline the process. This was my first time working with UX design principles as well as software like Axure and Sketch. It was a tremendous learning opportunity and the weekly feedback from my instructors helped me learn a lot in a short period of time. The end result was well thought out and solved an actual issue I had identified through user research. The user research part went especially well. I wish I had had the time and resources to test more often during my low fidelity wireframes. It would have saved a lot of time at the end when I ended up needing to make some larger changes late in the game. I could have thought through onboarding issues earlier in the process and incorporated user feedback there. Given more time, I would have integrated other apps like TaskRabbit and Venmo.